Gestures: Finger drag, double tap, single finger flick left/right, three finger flick left/right. Ballyland Magic is a fun iPad game that gives children a head start to using an iPad or other iOS mobile touch screen device by way of VoiceOver, Apple’s built-in screen reader. 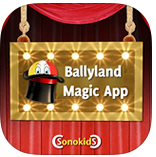 The four multi-level scenes of the Magic App follow the Ballylanders in their preparations for a performance in a Magic Show. Children practice their own 'magic' touch gestures while they move through the app. When they have mastered all the required touch gestures, they are put in charge of the Ballyland Magic Show! While they play and interact with the Ballylanders, the children learn accessibility concepts and fundamental finger gestures for VoiceOver. You don’t need to be a VoiceOver expert to assist the child – but by the end of the Magic Show, you may be well on your way to becoming one!! "My student struggled with the double tap. Thanks to the fun 'Tap Tap Song', she managed to adapt her motor performance and perfect this important VoiceOver gesture in record time, much to her own delight".